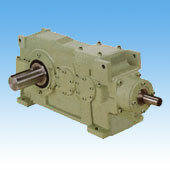 A compact and powerful right angle, parallel shaft helical reducer. Comes in a wide variety of models including motorized units to meet your application needs. It is the most compact in its class. Modular housing allows various possible mounting positions.